An experienced, firm but benevolent alpha willing to provide plenty of attention, exercise, socialization and gentle guidance can forge a lifetime bond with a male Doberman pinscher. If you dig big, the Dobie might be your dream machine. Not just another pretty face, this sleek, elegant gent is a supreme athlete of substantial proportions. 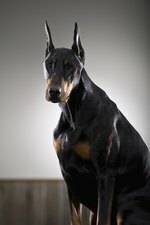 The American Kennel Club's breed standard allows a height of 26 to 28 inches for mature male Dobermans, with 27 1/2 inches being preferred. These big boys may weigh 65 to 90 pounds, with 70 pounds being typical. You'll have to stay on your toes to remain one step ahead of this canine brainiac, who has the size to back up his opinions. Obedient, vigilant and fearless with a robust protection drive, this dog's malevolent reputation is at least partially deserved. The typical Doberman is gentle and loving with his family. Yet in a twinkling he becomes defensive and highly aggressive toward any perceived threat to those he loves, exercising a naturally acute level of discernment. He'll need firm but kind handling from a strong pack leader, appropriate training from early puppyhood and plenty of exercise and mental challenges. Your watchful, adoring Dobie boy craves attention and requires affection, close bonding and a quality time commitment from everyone in the household.